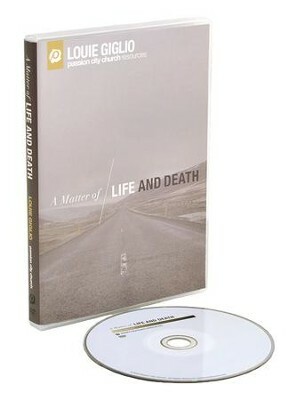 In this series, A Matter of Life and Death, Pastor Louie Giglio tackles fundamental life questions such as: Where do we go when we die? Is hell a real place? Is heaven real, and if so, is it somewhere we want to go? Does our life on earth affect our eternity? Pastor Louie boldly guides us in answering these questions with biblical truth, and makes us acutely aware of the beauty of heaven and the reality of hell. These messages teach us that God gives us the ability to embrace what the world fears most and that we have the opportunity to better leverage our lives here on earth. This series leaves us confident in the truth that with Jesus – death is life. A passionate communicator and leader, Louie Giglio is the Visionary Architect and Director of the Passion Movement, which includes the collegiate gatherings of Passion Conferences, Atlanta–based Passion City Church, EMI CMG label partner sixstepsrecords, and most recently Passion Publishing. The author of The Air I Breathe and I Am Not But I Know I AM, Louie is widely known for the Passion Talk Series DVD messages Indescribable and How Great Is Our God. As a communicator, Louie speaks for events throughout the U.S. and around the globe. A native of Atlanta and a graduate of Georgia State University, Louie has done post–graduate work at Baylor University and holds a Master's Degree from Southwestern Seminary. I'm the author/artist and I want to review A Matter Of Life and Death DVD.